Knives > Tactical > What to look for in a Combat Knife? In order to choose a combat knife for you – the most important thing that can be done is research. Research and learn about combat knives. This article will cover the basics of knife design, and structure in hopes to help the reader make the best choice of knife. Thinking of your combat knife as only a weapon is a very serious mistake. A combat knife is the most important tool of survival one could ever have. No matter the shape, or size, type you choose, Some day your combat knife may save your life. Choosing the shape of your combat knife is defined be several factors. The two most important factors in choosing a knife are usage and personal choice. Different shaped knives are designed for different purposes. 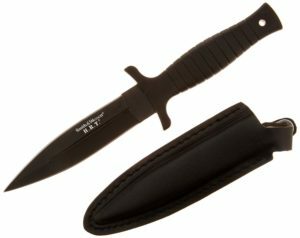 The combat knife is usually either a rounded “Bowie” style blade or a sturdy “Tanto” style. This is designed to be forced into the victims body without the possibility of breaking parts of the knife off as it scrapes bones. Most combat knives will have a sturdy hand grip and thumb guard to ensure that the users hand does not slip off the grip when pushing the blade into the victim. The chart below outlines some of the shapes of knives you may choose from. Notice the combat knife is a very distinct shape and has features many of the other knives do not. Folding blades have only on advantage over fixed blades. They can be folded into a smaller package, and do not require a sheath. This allows them to be carried in a pocket, or in a more stealthy manner. Past being able to be made smaller, folding knives or “folders” as they are often referred to have many disadvantages as a combat knife. Firstly, they have an inherent weak point – the folding point is a mechanical disadvantage. The smallest amount of stress on the folding mechanism can cause the pin to break, rendering the blade useless. Folding blades can also unexpectedly fold on their user, causing the user to be seriously injured. The locking mechanism on even the best folding knife can fail quickly. A folding knife is a good back-up knife, but should never be a primary combat knife or bushcraft knife. Knife handles on combat knives can be broken town into three distinct styles. Full-tank, Partial-tank and rat-tail tang. A partial tang blade is a blade which the metal blade extends only partially into the handle. This is often half or even less half which can adversely effect the rigidity of the knife handle. This type of handle is more prone to breakage. In the event the handle breaks from hard use in a survival situation, it will become unusable as a knife. The Rat-Tail Tang is the most common type of handle used in combat knives. These are used in famous knives such as the Ka-Bar combat knife and used in many tough knives such as Gerber knives. Although not as strong as a full tang, they are suitable for almost all conditions. Full Tang is normally only seen on very expensive combat knives. This type of blade has a wide, heavy duty handle which is as large, or larger than the blade itself. The handles attached to the blade are called “scales” which can often be removed or replaced for added versatility. Full tang knives are often very heavy due to their tough construction. Few new combat knife buyers will think of the knife edge. A knife edge is almost purely personal preference. A knife edge can also be re-ground by the user to suit their personal choice. Although many people different grinds have different advantages / disadvantages, it is most important to keep your combat knife sharp. A dull knife is of no use and can be a danger to the user. Many experienced outdoor professionals will prefer the Scandi grind due to its ease of use, long edge retention, and ability to cut. Whichever combat knife you choose, remember to do research on the styles of knives, their advantages/disadvantages and which is the best knife for you – the user. No matter which advice you take, which expert you follow, remember your blade is yours, and yours alone. Whichever choice you make, it must suit your specific needs.